Talk about underappreciated pioneers: Sister Rosetta Tharpe broke so much ground that it boggles the mind. With an apparent lack of concern about the possible consequences, she defiantly crossed over from the gospel field to secular stardom and back again, her earthy vocal style clicking in both idioms. Tharpe introduced sanctified music to the patrons of Harlem's Cotton Club, sang with the orchestras of Cab Calloway and Lucky Millinder, and played some of the era's toughest lead guitar, whether on acoustic or electric models. Born Rosetta Nubin in Cotton Plant, Arkansas on March 20, 1915, she hit the road with her mother, traveling evangelist Katie Bell Nubin, the pair settling in Chicago at age six. 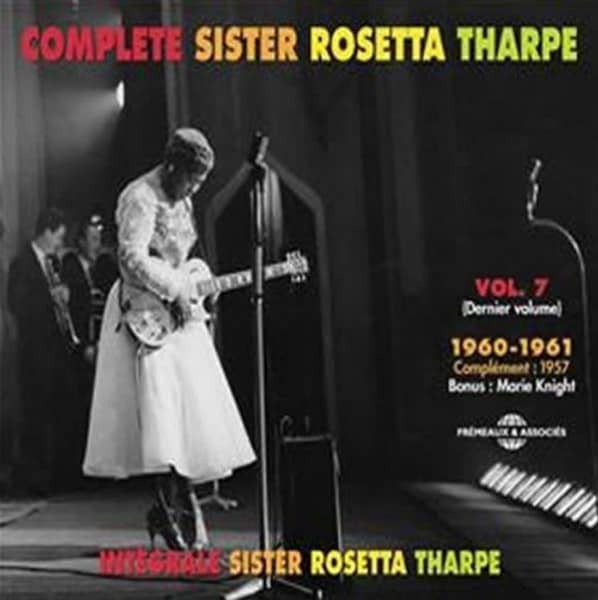 Rosetta's youth was largely spent singing church music (she was briefly married to a pastor named Thorpe in 1934, later changing her surname to Tharpe). She moved to New York in 1936, and in '38 regaled the sinners at the Cotton Club with her uplifting numbers. That move earned Tharpe a recording contract almost immediately with Decca, where she laid down such seminal spirituals as Rock Me, That's All, and This Train, her guitar always integral to her rousing presentation. Intriguingly, Rosetta saw no harm in waxing blues such as Trouble In Mind or the ribald I Want A Tall Skinny Papa. Her biggest hit for Decca came in the spring of 1945 with the stomping Strange Things Happening Every Day, a #2 R&B smash boasting a bristling Tharpe guitar solo soaked in blues that anticipated the rock and roll revolution still a decade in the future. Backing pianist Sam Price was a Texas blues veteran in his own right (bassist Abe Bolar and drummer Harold 'Doc' West rounded out his trio on the September 22, 1944 New York date). The flamboyant Tharpe drew 25,000 paying customers to her 1951 wedding ceremony and donned luxurious mink coats later in her career, when she wielded a white solid body electric guitar and tore it up. She died October 9, 1973 following a stroke, her monumental contributions as the earliest sanctified-to-secular crossover star and a blistering lead guitarist to boot all too often overlooked. Customer evaluation for "Complete Vol. 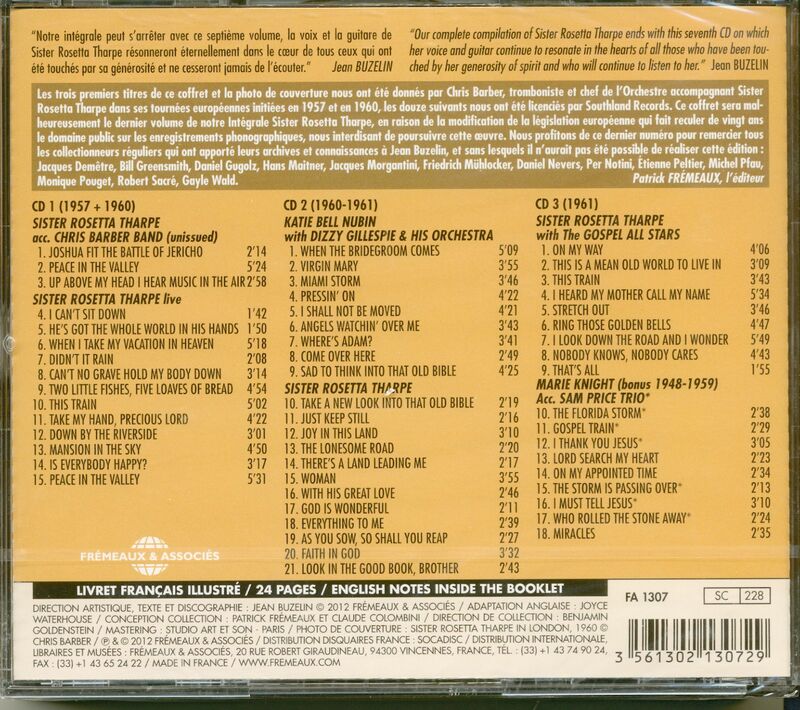 7 (3-CD)"